Preparation: To enjoy your steak at its best, take out of the fridge and remove packaging 10 minutes before cooking. For best results we recommend pan frying. Rub or brush each side of the steak with frying oil and season with sea salt and freshly ground black pepper. Tip. 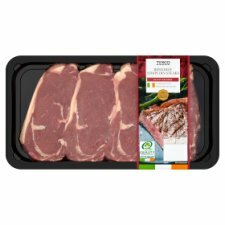 for crispy striploin fat carefully using cooking tongs to hold the steak on its side for a minute in the hot frying pan searing just the fat. These instructions are given as guideline only as steak thickness will vary slightly. Grill, Medium/High, 10-16 mins. Place steak on a tray in a pre-heated medium/high grill for 10-12 minutes (rare), 12-14 minutes (medium), 14-16 minutes (well done) turning halfway through cooking. Remove from grill and allow to rest for 3-5 minutes before serving. Pan Fry, High/Medium, 6-10 mins. Pre-heat a heavy based pan on a high heat and fry the steak for 1 minute on each side to seal in the juices. Reduce to a medium heat and cook for a further 4 minutes(rare), 6 minutes(medium), 8 minutes(well done) turning halfway through cooking. Remove from pan and allow to rest for 3-5 minutes before serving.